This painting, like Boy with a Butterfly Net, dates from Matisse’s immediate post-Fauvist period, and is a characteristic example of his painting to its most elemental. Broad blocks of color indicate land, water and sky. The thick contour lines defining the bathers seem pictorial and sculptural at the same time, and indicate Matisse’s struggle to reconcile volume and two-dimensional design through reductive means. 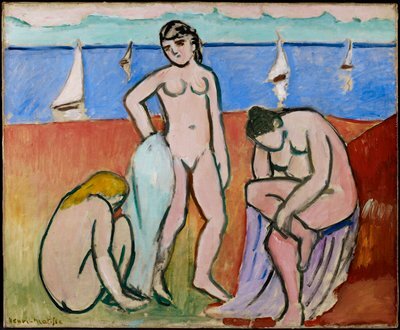 Three Bathers relates to Matisse’s much larger Bathers with a Turtle from 1908, now in the St. Louis Art Museum. These paintings inaugurated a period of artistic experimentation that culminated in Matisse’s monumental painting known as The Dance.